NOTE: Forecast is still a beta. It has been tested and used in production for two years, but the interface is still a bit rough. Feedback is welcome in the Overcast Slack group. Fixed importing markers from Amadeus Pro. Fixed importing markers from certain files exported by Logic Pro. Fixed importing markers from Adobe Audition. Fixed a crash when opening some VBR MP3 files. Can now select and delete multiple chapters at once. Manual chapter creation is slightly smoother. Removed VBR modes — I didn’t intend to ship those publicly (oops). 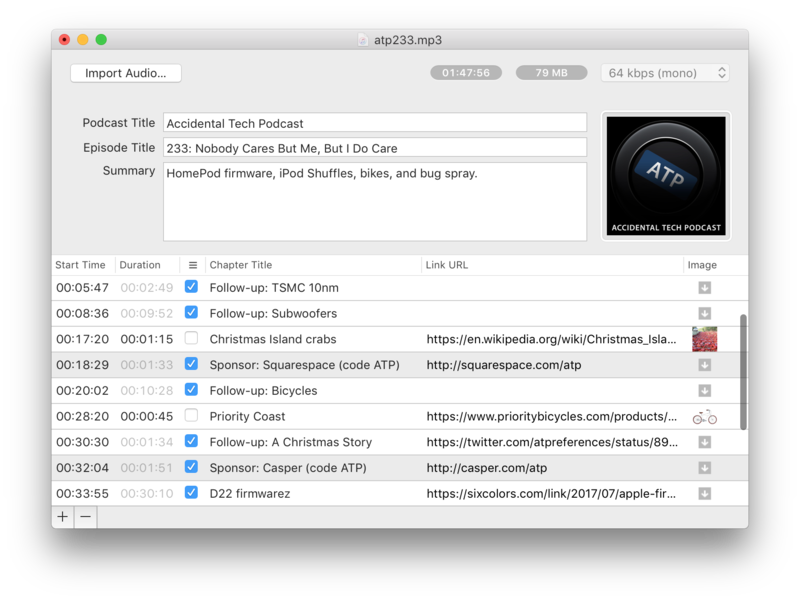 VBR isn’t supported enough yet to be responsibly used for podcasts. If and when that changes, it’ll be back.